NEW! 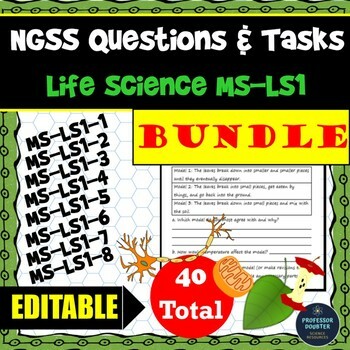 This bundled resource contains quality, EDITABLE sample assessment, test questions and performance tasks for the NGSS Middle School Life Science Performance Expectations MS-LS1 From Molecules to Organisms. It includes 40 questions or tasks total for MS-LS1-1 through MS-LS1-8 only. The questions can be edited, copied and pasted into various forms of assessments to align to the NGSS. Ideas for differentiation, answers keys, and links to other online resources to help teach the standards are also provided! See sample question below! 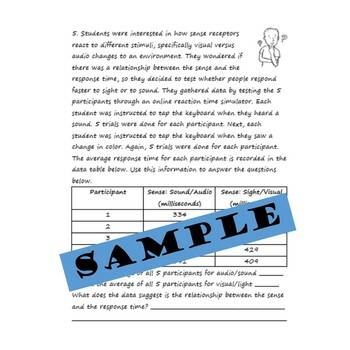 Use these sample questions for: pre-assessments, check-ins or quizzes, unit tests, and/or for your professional growth objectives! Each Performance Expectation includes a set of 5 questions that require students to use Science and Engineering Practices as well as Crosscutting Concepts to demonstrate understanding of the Disciplinary Core Ideas. The SEPs and CCCs are listed for each PE. Keep in mind that the tasks require more time than a standard test question, therefore, there should be fewer questions on a test which allows for more time to solve the problems. MS-LS1-1 Observe the chart below (chart provided in document). The images of the organisms were taken of specimens using a standard light microscope. Using the information/evidence in the chart to answer the questions. a. What patterns do you see in the chart? Name at least two. b. 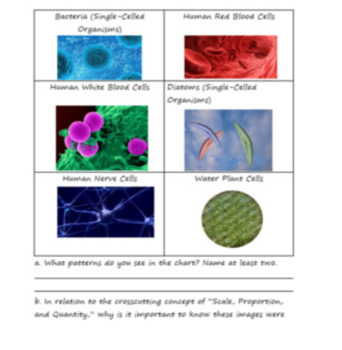 In relation to the crosscutting concept of “Scale, Proportion, and Quantity,” why is it important to know these images were taken using a light microscope (standard microscope)? 40 EDITABLE questions, tasks, etc. Looking for assessments for individual Life Science MS-LS1 standards? Interested in other Life Science products? If you like it, rate me! 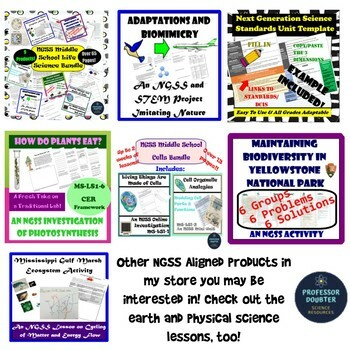 Also check out my other awesome NGSS lessons in my store AND BE SURE TO FOLLOW ME TO STAY UP-TO-DATE ON MY LATEST RESOURCES!!! !